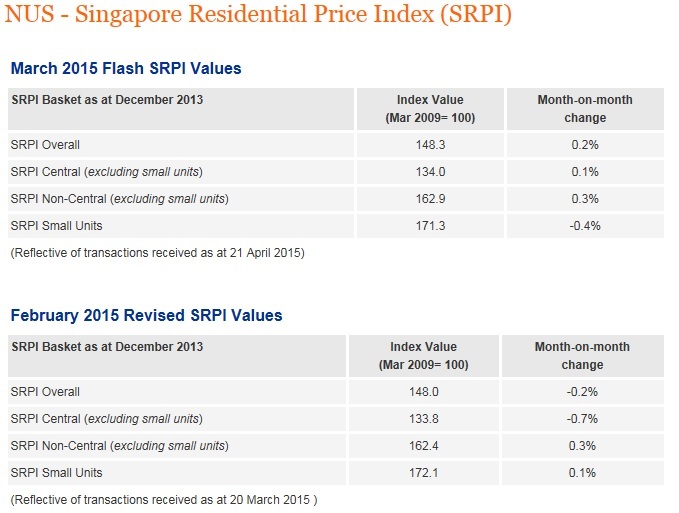 Prices of completed non-landed residential properties are beginning to creep up again after four months of decline, revealed the NUS Singapore Residential Price Index (SRPI). In March 2015, prices of such homes across the island increased 0.2 percent after falling 0.2 percent in the previous month. Excluding small units, prices in the central region rose 0.1 percent while the non-central region registered a 0.3 percent uptick in the month. But prices of small units, which have a floor area of 506 sq ft or below, reported a 0.4 percent drop. The NUS price index for the central region looks at properties located in districts 1 to 4 and 9 to 11. Properties outside these districts fall under the non-central region. This entry was posted in Property Market / Real Estate and tagged non-landed residential properties, Resale prices, Singapore Residential Price, Singapore Residential Property. Bookmark the permalink.